Crisp, clear days, brilliantly colored leaves and seasonal garden goodies (like gourds and pumpkins) make fall the perfect time for fun, creative activities with your kids. This is a great way to get your kids involved in beautifying your front yard for the fall season. Materials you will need to create your autumn yard collage include hay bales, pumpkins (all sizes), scarecrows, witches, cornucopias, etc. (Anything related to fall will look wonderful). Stack your hay bales to create a backdrop. Next, place a huge scarecrow (or witch) on the center of the stack. 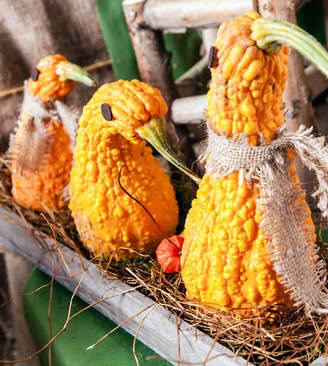 Then add other complimentary fall accessories like cornucopias, corn stacks, ghosts, etc. Making a haunted tree is a fun activity for everyone. It is especially great to do right after raking leaves. First, pick the biggest, best tree in your front yard; preferably one with many long, crooked limbs. Next, take small white trash bags and stuff the top half with leaves from your yard. Twist and tie the bag into a knot, or use a twist-tie to close the end where the leaves stop. Turn upside down and you have a ghost! Make as many of these ghosts as you can, then tie them to tree limbs. As the fall winds blow, your ghosts will haunt your tree. Supply each kid with markers, paper, glue, glitter, stickers, etc. Let them make several autumn cards and write a special message on the inside of each one. After any wet appliqués are dried, gather the cards and take them to your local nursing home to distribute among patients.